This thread is for comments about our Sweep Attack Crusader build guide. This needs to be updated, with the new 75 % attack speed attack speed on Roland's Visage set; Attack Speed serves 0 benefit, even Gogok of Swiftness is only adding CDR/Dodge with this. The Furnace in hand Golden Flense in Cube. 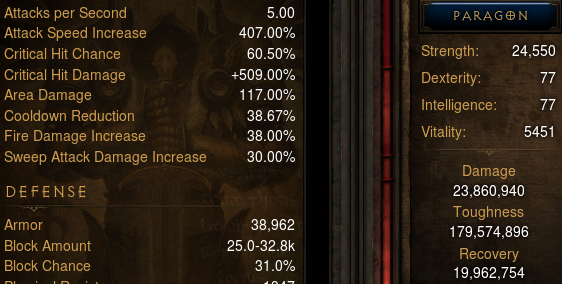 same rule as condemn since attack speed is not beneficial to damage anymore slow base weapon has higher hit damage. test for yourself if you wish. screen shot, wearing The Furnace, Bane of the Stricken, Bane of the Trapped, Esoteric Alteration still hits max frames and sheet attack speed. how about focus/restraint, using slash/sweep ? Wanted to ask if we can replace "Condemn" with Judgement or Shield Glare as both of these are Defensive skills and both have the option to immobilize enemies in the path. Or is this because the enemies get immobilized lesser and lesser over time which is why Condemn with a Damage to it makes more sense? Curious about the shield glare idea as well because if that can be a thing would flail of the ascended be more viable than furnace at that point? In speedfarm variant resource runs out quickly on bosses, goblins or other single targets so I'd consider swapping for Laws of Valor - Unstoppable Force or Akarat's Champion - Embodiment of Power. Also there's Lightning Damage on recommended amulet stats but we're dealing Holy Damage here. How can i have condemn and steel charge at the same time?